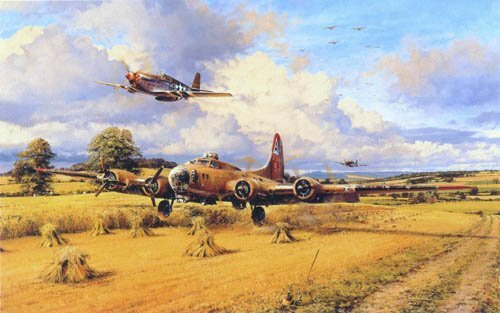 Damaged by flak and enemy fighters, and almost out of fuel, after a gruelling eight hour mission the pilot of this B-17 Fortress makes a forced landing in the safety of an English cornfield. A pair of P-51 Mustangs have escorted the damaged aircraft back across the North Sea, and peel off as they see their charge safely back on friendly soil. Overall print size: 25" x 34"